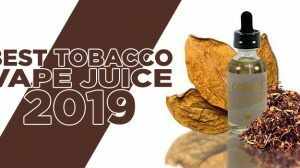 Could the coil-less tank system be the next logical step in vaping? According to Pioneer4You it is, as they’ve just recently released the all new iPV Pure X2. This is happening just as the industry has taken a long hard look at increasing the longevity of heating systems to make the consumers life easier and cheaper. 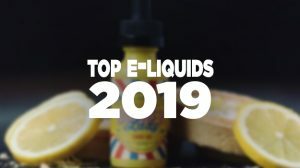 Over the last year, the innovation in the tank market has been phenomenal, don’t get me wrong, but they were all based around the same coil system — wicks jammed through a basic metal wrap, whether it is designed for power vaping or temperature control. The Pure X2 has removed the rings and replaced them with a heating element that honestly reminds me of an auto fuse without the plastic casing. However, from what I have seen it works like a charm. 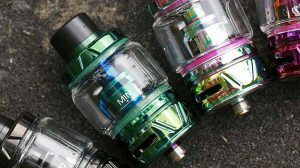 No more pinching and rolling when you try to wick, the massive wicking channels are designed to drink e-liquid like a man who’s been in the desert for a week. Simplicity is the key to this design — it is literally a throw and go system. Pioneer4You has said that this system is designed to be dry burned and reused, a great way to save the consumer money and headaches, especially if like me you think that build decks are a chore and replacement coils are getting expensive. 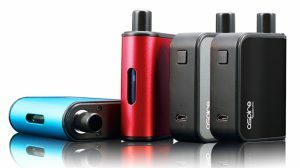 This system has been designed to work in perfect harmony with the iPV5’s Pure SX technology, but also works well with any other device currently on the market. Created from a special alloy, the heating element fires quickly at low-wattage, removing the need for excessive power and extending your battery life exponentially. It is designed to fire up to 75 watts in power mode and 75 joules in temperature control. As for the rest of the tank, let’s take a moment to break it down. The 24mm diameter tank sits perfectly on top of almost any mod in your collection. 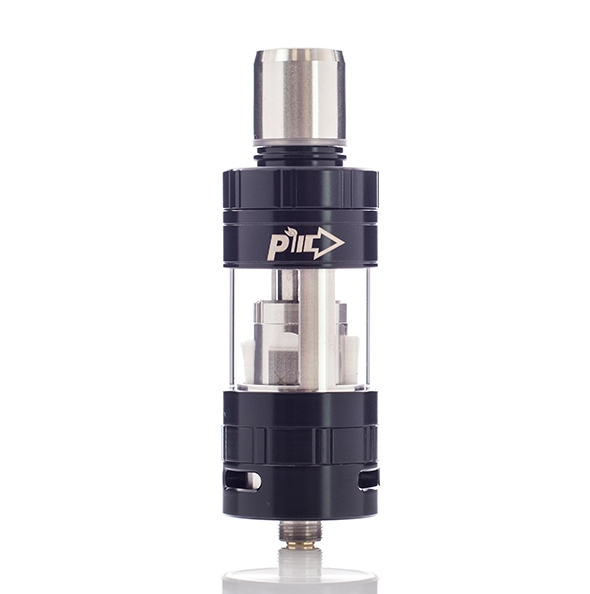 Created from Stainless Steel and Pyrex glass, from the outside it looks comparable to many other Sub-Ohm Tanks. Sleek, stylish, and available in white, black, blue or Stainless Steel, they’ve created a tank for any taste. 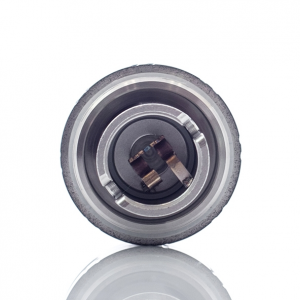 The removable drip tip can be replaced by any friction fit 510 that you choose, although the one that comes as standard works flawlessly. This is a top fill system, after unscrewing the top plate you will find the wide area filling ports. Unlike some of the competition, you can actually use a glass dripper to feed the beast. If you are filling on fresh wicks, just remember that this has a lot of cotton to fill on the first pass and will soak it up accordingly. The 510 connector in the base is a non-adjustable gold-plated piece — it does its job well and looks good in the process. You have a triple adjustable airflow system in the base, each one 3mm x 9mm, which can be clicked into various settings. This airflow is ample for the system inside and then some. The result? The whole system providing thick voluptuous clouds, and as you would expect, amazing flavor. 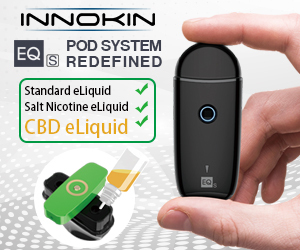 This tank seems solid and the concept of the coil-less system seems great in theory, but will require further testing and use to validate the claims. Anything that can take a 5 minute job of replacing a coil or the twisting and rolling of re-wicking is definitely worth a look in my opinion. Thanks for the overview ..
Any idea if the heating element for the IPV Pure x2 is going to last as long as the Altus Coil-Less Tank by Guo? If memory serves me, I believe they said the Altus heating element would be expected to last essentially for as long as you own the tank (while staying within their recommended guidelines during use). However, when watching some of the reviews / videos online I heard that the IPV Pure coil-less tank’s heating element is only expected to last around 3 months. I’m not sure if that expectation is based off the x1 or x2 model, but if the heating elements are only expected to last 3 months has Pioneer4you made any indications of the cost to replacement the Pure x2 heating elementst? I ask because if they’re expecting users to go through 4 heating elements per year the potential long-term costs could be substantial.